Establish standardized policies to minimize risk of business interruption due to EH&S events. Establish cross-functional teams to bring knowledge and viewpoints from multiple business areas and get everyone thinking about safety. Make your business process auditable and transparent for all functional groups. 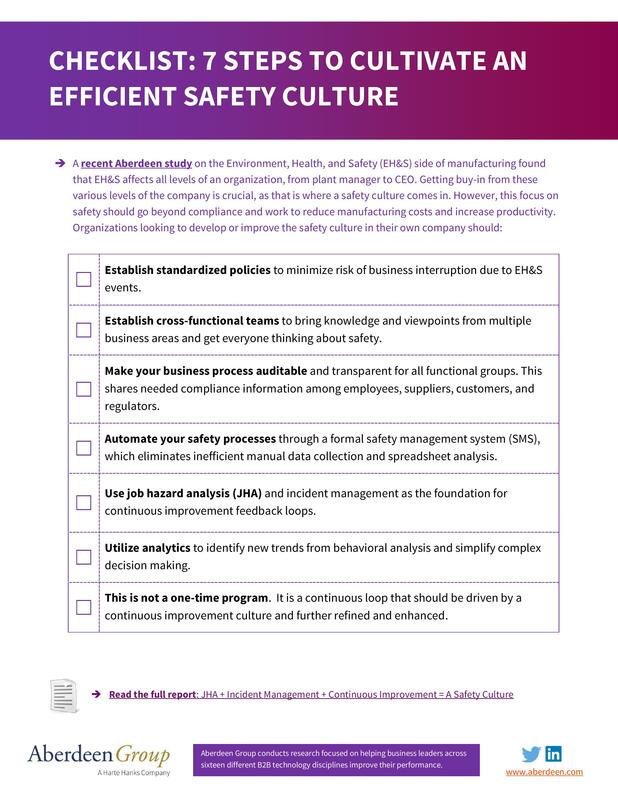 This shares needed compliance information among employees, suppliers, customers, and regulators. Automate your safety processes through a formal safety management system (SMS), which eliminates inefficient manual data collection and spreadsheet analysis. Use job hazard analysis (JHA) and incident management as the foundation for continuous improvement feedback loops. Utilize analytics to identify new trends from behavioral analysis and simplify complex decision making. This is not a one-time program. It is a continuous loop that should be driven by a continuous improvement culture and further refined and enhanced.